4/14/2009 — For the most part, I’ve been able to treat my lack of employment as a much needed vacation. Most days I scour the net for opportunities, email out resumes and portfolio links, do some odds and ends around the house, and then my day is my own. It’s not a bad way to live, actually, but the pay is awful. Now that spring seems to have actually arrived (knock wood) in Minnesota, I’ve been lucky enough to spend most of my free time out riding my Vespa. That was the plan for today. Things sort of went according to plan. With what duty I had doable done, I headed out to find a big lake west of Wayzata out highway 12 that The Mrs and I discovered last season. I’ve really been diggin’ outdoor places of scene and solitude lately. They’re helping me get my head a good place. As I wondered north, I noticed something strange in the Vespa. I was planning to head up the highway, so I had my earplugs in. You know how when you have your ears shut you can hear things in your body that you normally feel? Your own footsteps, your joints, your breathing — if they’re good earplugs, that’s about all you’re hearing. Today I was hearing — or rather feeling — a strange, steady wobble in my seat and feet but not in my handle bars. Nice. Rear wheel again. My guess is that one of my flat tire incidents bent the rim. I headed for Scooterville and wondered if they’d be able to fit me in. Not a big deal, as I could always hop on the MetroTransit light rail and meet The Mrs at her office for a ride home. Turns out that’s where my day of riding ended…sort of. The day wrapped up with me and The Mrs down at the local tech college parking lot making use of the MSF course spray painted on their parking lot. She has her motorcycle endorsement road test tomorrow morning, so we practiced all the stuff that I screwed up when I took it. 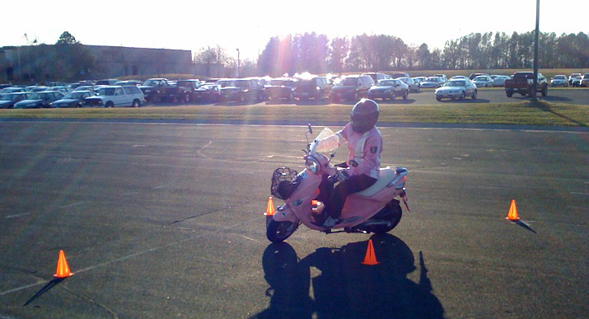 Good times and she’s awesome at riding between cones! Riding ’round Lake Minnetonka wobbly wheels and all. Spending quiet time at the source of Minnehaha Creek. Seeing how quick the light rail really is. Listening to Arcade Fire on the train and feeling like I was in a movie. Seeing a 747 seemingly stand still in the sky on final toward MSP. Seeing The Mrs master all the moves I screwed up on my riding test. Getting nearly merged into by a van on Hennepin Avenue. My trusty horn got his attention and thankfully he backed off. I thought I was going to have to straddle the twin yellow stripes for a second. Another day doing street battle. Also, seeing all the dead fish at the source of Minnehaha Creek was pretty icky. Hopefully that’s a spawning aftermath and not some sort of horrible pollution incident. I also got pulled over for the first time on a scooter. 48 mph in a 35 mph zone. The cop asked if I was on my way to work, and I think my response got me off with a warning, thankfully.